Ipsos i-Say is a site where you can get paid to take surveys. If you have read any other reviews on my site, you will know that there are many sites that offer this, but not all of them are legit. So is Ipsos i-Say a scam or a legit site worth joining? Let me reveal right away (as you can probably also figure out from the headline of this article), that it is a legit site. But do not just take my word for it. In this Ipsos I-Say review, I will give you all the details about the site, so you can decide for yourself, and see if it is a site you want to join or not. What is Ipsos i-Say and what does the site offer? The i-Say survey panel is owned and run by Ipsos, which is a global market research company. That is why it sometimes is called Ipsos I-Say and other times just i-Say, which is the name of the actually survey site. The company was founded in 1975 and is now one of the largest survey-based research companies in the world, as it has more than 15,000 employees all over the world. So it is built on a good foundation and has a big company behind it, which can be nice when it comes to choosing a survey site. But let us now look into what i-Say offers you as a member. 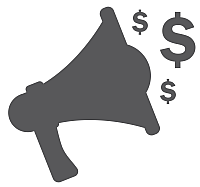 The best way to earn money on Ipsos i-Say is by doing paid surveys. There are a decent amount of surveys, but it can take patience to find the ones you qualify for, and it does not offer as many opportunities as many other panels. Exactly how many opportunities you will have can vary from country to country. Some countries will have several opportunities every day, and others have a lot less. The surveys are about a wide range of topics like politics, lifestyle, entertainment, music, household products etc. So there can be some quite interesting topics, where it is nice to have ýour opinion heard. Ipsos I-Say has surveys with some interesting and relevant topics. 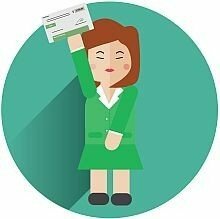 You will get an email notification when there is a new survey available for you. To get more opportunities, it is a good idea to fill out your profile info after you join. A great extra way to earn on Ipsos i-Say is through the loyalty program. It is a program that you are automatically a part of as a member. It is a program where you will get higher bonuses the more active you are. The activity period is within a calendar year, so the activity that counts towards your bonus is from January to December, and it will then be reset. You can see the bonus levels on the image below. The Ipsos I-Say loyalty program. 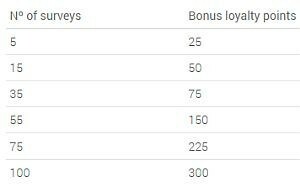 The image shows that after having done 5 surveys within a year, you will get 25 points as a bonus, when you have done 15, you will get 50 points etc. It is not bonuses that is going to break your bank, but if you are an active member, it is some nice extra rewards to get. Be aware that the loyalty program is only available in select countries. Ipsos i-Say has several contests that are free to participate in. There is the welcome draw, which is a draw that all new members will automatically enter into. In this prize draw, you have the chance to win a prepaid shopping card worth around $100. There are 30 winners selected every 4 months. The exact size of the reward and way to use it can vary from country to country. No matter how long you have been a member, you can also participate in what is called “The Click Draw”. It is a free contest, and every 4 months 10 panels members win 10,000 points. To participate in this draw, you just have to keep your profile updated, by answering any profile update questions that you will receive. There are at times also other contests. You can keep an eye on i-Say’s Facebook page where info is posted when there is a new contest. Sometimes there are contests that are only available for certain countries. These more local contests, you will be able to see once you are logged into your account. You can invite fiends to join Ipsos i-Say and get a reward for this. You can only invite friends to join by sending an email to them through the i-Say website after you are logged in. It says that you have to be aware only to invite people you know as it might otherwise be considered spam, and you can have your account terminated, if you use the invitations for spam. To get a reward for a friend you invite, the person has to live in the same country as you, and the person has to do at least one survey. If a person you invite fulfills this, you will get 100 points into your account (it is equivalent of around $1). Not a way to make a lot of money, but it can give a few extra bucks, if you know anybody that is interested in joining. Ipsos i-Say also tries to be a community. So you can post your own polls where other members can answer, you can answer other members polls, comment on them, and you can follow other members. I think the member created polls can be fun and entertaining, but it is not where I spend much time, as these polls do not pay. Some of them can however be fun, and it is a nice little extra touch to the platform, but just not something I personally would use. On Ipsos i-Say you get paid in points, which can then be converted into a number of different rewards depending on your preferences. The points will in many cases be converted into rewards in your local currency, but in general 1000 points are equivalent of $1. How many points you need to have to request a payout can vary from country to country, but it is usually somewhere between 10,000-15,000 points ($10-$15). It can also vary depending on the type of reward you want. There can be different rewards for the different countries. In some countries you can get paid through PayPal, which is my personal favorite. However, if you like getting paid this way, there are many PayPal survey sites with better opportunities. In all countries you can also choose between a number of different gift cards to for example Amazon, Starbucks, iTunes, Visa etc. so you can definitely find something nice to get for your earnings. You can also choose to donate your earnings to charity. How much money can you make on Ipsos i-Say? Ipsos i-Say has some opportunities, the rewards for the time spent are decent for a survey site, and it has some good rewards, you can choose from. So it can make a little extra money on the side. But compared to the top paying survey sites, Ipsos i-Say is not impressive, and does not offer a lot of opportunities. As it is very easy to use, it can still be worth signing up for as an extra site, but only if you are planning to join as many sites as possible. If you only want to join a few, i-Say will not be a good choice in my opinion. Remember that when it comes to survey sites in general, it is NOT a way to get rich and make a lot of quick money. It can give some nice extra money, but it will not make you rich. Surveys are however a great way to have your opinion heard on important topics and getting paid for it at the same time – that is why I personally think paid surveys are great, but you need to do it with the right expectations. If you are looking to make a full-time income online, you should not start joining survey sites. Does Ipsos i-Say have an app? 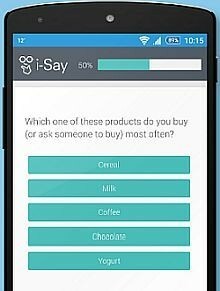 Ipsos i-say has an app that makes it easy to participate in surveys on the go. The app gives you access to all the same things, you have access to through the normal website. You can both do surveys, participate in the community, and redeem rewards. I think survey apps can be a great way to do surveys, as I often do it when I have a bit of extra time, when I am on the go. You can set the app to let you know every time there is a new survey available, but if you do not like getting notifications like this, you can also adjust the frequency of the notifications in the I-Say app. I really like that it is possible to adjust the frequency, as most other survey apps only has the option to either get all the notifications or none. Great to have an option to adjust according to ones own preferences. The app is available for Android and iOS. It is however not available in all countries. But if you live in a country where the app is not available, you can still use Ipsos i-Say on your phone. You just click the invitation link in the email you receive, and you can do the survey then. Sometimes a survey is not available on a phone, because you need a certain screen size for it, but then you will be told. Ipsos i-Say is available in around 100 countries, so if you want to join, there is a good chance you can. How old you have to be to join can vary from country to country. In some countries you can join when you are 16, and in others you have to wait until you are 18. I am assuming it depends on local laws, so you have to check to be sure in you own country – you can check by on Ipsos i-Say’s website in your country, how old you have to be to join. Be aware how many opportunities you get will vary from country to country. As already mentioned, Ipsos i-Say, will however not be one of the survey sites with the most opportunities no matter the country you live in. If you only want to join the best sites, you can check out the list of the best sites in your country here. If you should need support, Ipsos i-Say has the option for you to contact them. You can do it by logging in to your account and clicking “contact” in the footer menu of the page. A way that might be faster is to contact the support on Facebook. You can either comment on one of the posts, or send a private message. I have been in contact with staff from Ipsos i-say several times, and I must say this is one of the most disappointing aspects of the panel. Home good service their staff gives tells a lot about a company. The ones I have been in contact with have been slow and very poor at giving useful information for my questions. This is a BIG minus about Ipsos i-Say in my opinion. As I already mentioned it the beginning, Ipsos i-Say is a survey site that is legit. But let’s sum up the pros and cons, so you can get a better overview and see, if it a site you find worth joining. In general, I think Ipsos i-Say is only worth joining, if you want to join as many survey sites as possible. If you want to only go for sites with good earning opportunities, you should definitely join the top paying survey sites instead, and i-Say is not one of them. If you have any questions, concerns, comments, or have any experiences with Ipsos i-Say yourself you would like to share, I would love to hear from you in a comment below. Ipsos i-Say is a survey panel owned by a reputable company. It has decent earning options in many countries, but compared to many other sites, it does not have many opportunities. It is a legit site, but it can take some patience to make money on it. I was encouraged to sign up to Ipsos-Isay as a bit of a fun way to earn little rewards. At first I didn’t think it was too bad, despite spending far too much time answering screening questions before being screened out, and despite it taking ages to earn a small reward to cash out. Now I think Ipsos is so badly run, they have too many people signed up and a poor admin system, meaning they can’t keep track of their surveys and participants. Twice I’ve been invited to take part in product tests, and twice I done everything properly, and they haven’t paid out. And when I chase them, they say they can’t find the records and expect me to have kept records of the survey codes and dates etc etc. When I tell them I haven’t, they say there’s nothing they can do and don’t pay me. It seems to be a buyers market, and they have so many people signed up, it doesn’t worry them if they leave disgruntled people behind. Sorry to hear that. But thank you for sharing with the rest of us. I have personally also had very poor experiences with the iSay support. I agree with you that is seems to have some problems with how it is run, unfortunately. Thank you for the reviews you do here. Saves a lot of time and therefore money. Some survey sites are just a waste of precious time. Quick question, is this viable for people in the caribbean? I imagine the frequency might be very low. If so, Any other suggestions? Thanks for the feedback Crystal. Glad to hear you find the info useful. Ipsos i-say is also available for many countries in the Caribbean. I can unfortunately not say how many surveys you will get there. But if you decide to join, feel free to let me know how it goes and how the opportunities are there.. For that area, I would also recommend you to check out ClixSense. An average survey is about 10-15 minutes. But you can also have some that are only 5 minutes and some that are longer. But if it is longer, the reward will also be higher. It os really difficult to say how much you can make in a week, if you live in a country where there are good opportunities as it depends on a lot of things. But if you join several sites and dedicate some time every day, it can be possible to make between $50-200 in a week. On more or less all survey sites there will be surveys you do not qualify for. That also goes for Ipsos i-say. In my experience, I do however qualify more often on i-say than I do on average on other sites. Hope this helps, and if you have more question, just ask again. 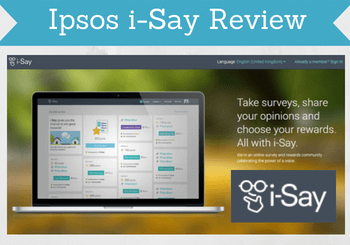 I like your Ipsos i-Say Review site about surveys. I joined Ipsos i-Say in the past and they do have different types of surveys such as healthcare, government and more. Most survey sites do not pay that much you have to get rejected to surveys just to get a dollar. It is also good to sign up to more than one survey site just like you said. Thanks for sharing your experiences Felisha. At more or less all survey sites you will regularly not qualify for surveys unfortunately. But after a while it is possible to figure out which surveys you qualify for the most and just go for those. But in general, getting rejected for some surveys is a part of doing paid surveys, but on some sites it happens more often than on others. In my experience, at i-Say I qualify quite often compared to some other sites.